Why don't people wear shirts when they shop at Walmart? Or pants that fit? Has that woman been wearing a fanny pack for 15 years or did she just recently pick up on the belt-as-purse trend? Is that guy wearing a cape? People of Walmart, a website that launched earlier this month, catalogs the gloriously absurd attire that is sported by the big-box retailer's customer base. There are photos of fat people in sweatpants, a child with a rattail and a guy wearing a Captain America costume. But the website's founders, three guys in their early 20s who preferred to provide only their first names, aren't interested in stereotypical rednecks or run-of-the-mill mullet sightings. "Mullets are too common," says Andrew, who is 23 and lives in Indiana. "We want to document the kind of stuff that when you see it, you immediately have to call someone and be like, 'Dude, I'm at Walmart and I just saw a goat.' "
Andrew, his brother Adam and their friend Luke started People of Walmart after a shopping trip to a South Carolina branch earlier this month. "We turned a corner to see a stripper  at least, I think she was a stripper  with a shirt that read 'Go F___ Yourself,' and she had a 2-year-old kid in one of those child harnesses that looked like a dog leash," says Adam. They turned another corner and saw a guy with a ZZ Top beard. Inspired by the experience, the three friends  who shop at Walmart regularly, sometimes while wearing ugly clothes  went home and created the website. They asked their friends to submit photos and naively assumed that no one outside their social circle would ever see it. "Honestly," says Andrew, "we didn't think we'd even update it very often." But the last week in August, People of Walmart went viral, earning mention on websites like Funny or Die. Its traffic increased by 700% on Aug. 27 alone. Photo submissions went from one or two to more than 120. The flood of visitors has even crashed the site. 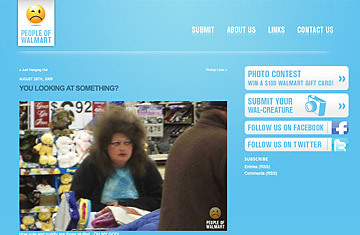 People of Walmart's founders expect some people to take issue with the site's tone. "I'm not gonna sit here and say the site isn't pretentious or that it doesn't poke fun at people  because it does," admits Adam, who says he "loves" Walmart. "But we have limits. We won't make fun of the people who can't help it." They do not publish photos of disabled people or Walmart employees who are just doing their job. "I can't tell you how many people send in pictures of overweight people on motorized scooters," he says. "But we won't post them because some of those people need scooters for a reason." He also refuses to post pictures of the Amish. Because of those ground rules, People of Walmart mostly ridicules folks with bad hairdos, excessive tattoos or ill-fitting clothing. "Look, I'm a big guy," says Adam. "I'm not going to walk around in medium-size clothes. I'd look like an idiot." By the same token, he figures, you shouldn't wear a Captain America costume, put your goat on a leash or let your pants fall down in public. If you do, you're begging to be laughed at  just like this woman. Read "Why Wal-Mart's First India Store Isn't a Wal-Mart." See the 10 oddest Marvel characters including Asbestos Lady and Spider-Ham.